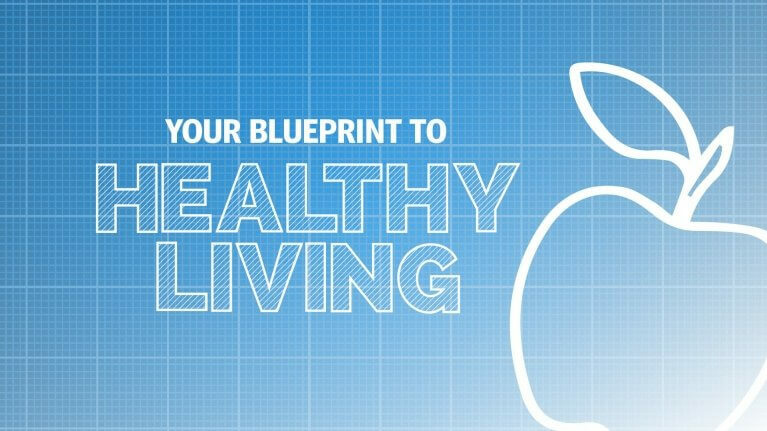 In this post we give tips about how they can improve or augment actions in their life to have a healthy lifestyle; it is not meant to be all inclusive but will include major components that are considered to be parts of a lifestyle that lead to good health. 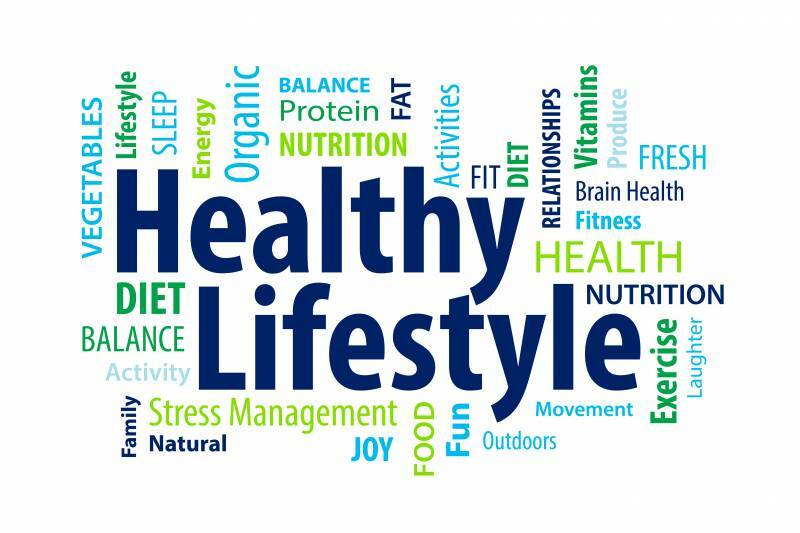 In addition to the tips about what people should do for healthy living, the article will mention some of the tips about avoiding actions (the don’ts) that lead to unhealthy living. A. Eat a variety of foods – For good health, we need more than 40 different nutrients, and no single food can supply them all. It is not about a single meal, it is about a balanced food choice over time that will make a difference! A high-fat lunch could be followed by a low-fat dinner. B. Base your diet on plenty of foods rich in carbohydrates – About half the calories in our diet should come from foods rich in carbohydrates, such as cereals, rice, pasta, potatoes, and bread. It is a good idea to include at least one of these at every meal. Wholegrain foods, like wholegrain bread, pasta, and cereals, will increase our fibre intake. We should avoid the consumption of total and saturated fats (often coming from foods of animal origin), and completely avoid trans fats; reading the labels helps to identify the sources. When cooking, we should boil, steam or bake, rather than frying, use vegetable oils. D. Enjoy plenty of fruits and vegetables – Fruits and vegetables are among the most important foods for giving us enough vitamins, minerals and fibre. We should try to eat at least 5 servings a day. For example, a glass of fresh fruit juice at breakfast, perhaps an apple and a piece of watermelon as snacks, and a good portion of different vegetables at each meal. F. Eat regularly, control the portion size – Eating a variety of foods, regularly, and in the right amounts is the best formula for a healthy diet. G. Drink plenty of fluids – Adults need to drink at least 1.5 litres of fluid a day! Or more if it’s very hot or they are physically active. Water is the best source, of course, and we can use tap or mineral water, sparkling or non-sparkling, plain or flavoured. Fruit juices, tea, soft drinks, milk and other drinks, can all be okay – from time to time. H. Maintain a healthy body weight – The right weight for each us depends on factors like our gender, height, age, and genes. Being overweight increases the risks of a wide range of diseases, including diabetes, heart diseases, and cancer. make time for a family weekend activity. Avoid eating a large meal before sleeping to decrease weight gain. Maximize with nutrient-packed foods : Give your body the nutrients it needs by eating a variety of nutrient-packed food, including whole grains, lean protein, fruits and vegetables, and low-fat or fat-free dairy. Eat less food high in solid fats, added sugars, and sodium (salt). Energize with grains : Your body’s quickest energy source comes from foods such as bread, pasta, oatmeal, cereals, and tortillas. Be sure to make at least half of your grain food choices whole-grain foods like whole-wheat bread or pasta and brown rice. Power up with protein : Protein is essential for building and repairing muscle. Get your protein from seafood twice a week. Quality protein sources come from plant based foods, too. Mix it up with plant protein foods : Variety is great! Choose beans and peas (kidney, pinto, black, or white beans; split peas; chickpeas; hummus), soy products (tofu, tempeh, veggie burgers), and unsalted nuts and seeds. Vary your fruits and vegetables : Get the nutrients your body needs by eating a variety of colors, in various ways. Try blue, red, or black berries; red and yellow peppers; and dark greens like spinach and kale. Choose fresh, frozen, low-sodium canned, dried, or 100 percent juice options. Don’t forget dairy : Foods like fat-free and low-fat milk, cheese, yogurt, and fortified soy beverages (soymilk) help to build and maintain strong bones needed for everyday activities. Balance your meals : Use MyPlate as a reminder to include all food groups each day. Drink water : Stay hydrated by drinking water instead of sugary drinks. Keep a reusable water bottle with you to always have water on hand. Know how much to eat : Get personalized nutrition information based on your age, gender, height, weight, current physical activity level, and other factors. Use some App to determine your calorie needs, plan a diet that’s right for you, and track progress toward your goals. When phones battery is low to last bar, don’t answer the call because the radiation 100 times stronger. Red – Supports prostate, Urinary tract and DNA health. Protects against cancer and heart diseases. Green – Supports eye health, arterial function, lung health, liver function, and cell health. Helps wound healing and gum health. Yellow – Good for eye health, healthy immune function, and healthy growth development. e.g. Pineapple, Carrot, banana, Lemon, Grapefruit, Pear, Corn, Papaya, Oranges, Mango, Peach. 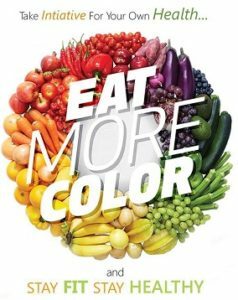 GOAL – Eat two foods from each color group daily. Don’t drink Sugar calories : Sugary drinks are the most fattening things you can put into your body. Sugary drinks are strongly associated with obesity, type 2 diabetes, heart disease and all sorts of health problems. Eat Nuts : Despite being high in fat, nuts are incredibly nutritious and healthy. They are loaded with magnesium, vitamin E, fiber and various other nutrients. Copy your kitty : Learn to do stretching exercises when you wake up. It boosts circulation and digestion, and eases back pain. Bone up daily : Get your daily calcium by popping a tab, chugging milk or eating yoghurt. It’ll keep your bones strong. Remember that your bone density declines after the age of 30. You need at least 200 milligrams daily, which you should combine with magnesium, or it simply won’t be absorbed. Don’t fear Coffee : Coffee has been unfairly demonized. The truth is that it’s actually very healthy. Coffee is high in antioxidants, and studies show that coffee drinkers live longer, and have a reduced risk of type 2 diabetes, Parkinson’s disease, Alzheimer’s and numerous other diseases. Drink some water especially before meal : Drinking enough water can have numerous benefits. One important factor, is that it can help boost the amount of calories you burn. Avoid bright lights before you sleep : When we’re exposed to bright lights in the evening, this disrupts production of the sleep hormone melatonin. An interesting “hack” is to use a pair of amber-tinted glasses that block blue light from entering your eyes in the evening. Take vitamin D3 if you don’t get much sunlight : Back in the day, most people got their vitamin D from the sun. If adequate sun exposure is not an option for you, then supplementing with vitamin D has been shown to have numerous benefits for health. This includes improved bone health, increased strength, reduced symptoms of depression and a lower risk of cancer, to name a few. Vitamin D may also help you live longer. Make sure to eat enough protein : Eating enough protein is incredibly important. Protein is particularly important for weight loss, and works via several different mechanisms. A high protein intake can boost metabolism significantly, while making you feel so full that you automatically eat fewer calories. It can also cut cravings and reduce the desire for late-night snacking. Eating plenty of protein has also been shown to lower blood sugar and blood pressure levels. Curry favour : Hot, spicy foods containing chillies or cayenne pepper trigger endorphins, the feel-good hormones. Endorphins have a powerful, almost narcotic, effect and make you feel good after exercising. I say tomato : Tomato is a superstar in the fruit and veggie pantheon. Tomatoes contain lycopene, a powerful cancer fighter. They’re also rich in vitamin C. The good news is that cooked tomatoes are also nutritious, so use them in pasta, soups and casseroles, as well as in salads. Eat your stress away : Prevent low blood sugar as it stresses you out. Eat regular and small healthy meals and keep fruit and veggies handy. Herbal teas will also soothe your frazzled nerves. Eating unrefined carbohydrates, nuts and bananas boosts the formation of serotonin, another feel-good drug. Small amounts of protein containing the amino acid tryptamine can give you a boost when stress tires you out. Load up on vitamin C : We need at least 90 mg of vitamin C per day and the best way to get this is by eating at least five servings of fresh fruit and vegetables every day. Use extra virgin olive oil : Extra virgin olive oil is the healthiest fat on the planet. Don’t eat a lot of refined carbohydrates : Not all carbs are created equal. Refined carbs have been highly processed, and have had all the fiber removed from them. They are low in nutrients (empty calories), and can be extremely harmful. Studies show that refined carbohydrates are linked to overeating and numerous metabolic diseases. No folly in folic acid. Folic acid should be taken regularly by all pregnant mums and people with a low immunity to disease. Folic acid prevents spina bifida in unborn babies and can play a role in cancer prevention. It is found in green leafy vegetables, fruit and bran. Lift heavy things : Lifting weights is one of the best things you can do to strengthen your body and improve your body composition. It also leads to massive improvements in metabolic health, including improved insulin sensitivity. The best approach is to go to a gym and lift weights, but doing body weight exercises can be just as effective. Take care of your relationships : Social relationships are incredibly important. 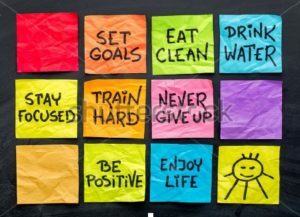 Not only for your mental wellbeing, but your physical health as well. Studies show that people who are close with friends and family are healthier and live much longer than those who are not. If you have excess belly fat, get rid of it : Not all body fat is equal. It is mostly the fat in your abdominal cavity, the belly fat, that causes problems. This fat builds up around the organs, and is strongly linked to metabolic disease. Burn fat during intervals. To improve your fitness quickly and lose weight, harness the joys of interval training. Set the treadmill or step machine on the interval programme, where your speed and workload varies from minute to minute. Build up gradually, every minute and return to the starting speed. Repeat this routine. Not only will it be less monotonous, but you can train for a shorter time and achieve greater results. Stop fuming. Don’t smoke and if you smoke already, do everything in your power to quit. Apart from the well-known risks of heart disease and cancer, orthopaedic surgeons have found that smoking accelerates bone density loss and constricts blood flow. Don’t go on a diet : Diets are notoriously ineffective, and rarely work well in the long term. In fact, “dieting” is one of the strongest predictors for future weight gain. Instead of going on a diet, try adopting a healthier lifestyle. Focus on nourishing your body, instead of depriving it. Weight loss should follow as a natural side effect of better food choices and improved metabolic health. Asthma-friendly sports. Swimming is the most asthma-friendly sport of all, but cycling, canoeing, fishing, sailing and walking are also good, according to the experts. Avoid Steamy hot water : Showering or bathing in water that’s too hot will dry out your skin and cause it to age prematurely. Warm water is much better. Apply moisturiser while your skin is still damp – it’ll be absorbed more easily. Adding a little olive oil to your bath with help keep your skin moisturised too. Here’s the rub. Improve your circulation and help your lymph glands to drain by the way you towel off. Helping your lymph glands function can help prevent them becoming infected. When drying off your limbs and torso, brush towards the groin on your legs and towards the armpits on your upper body. You can do the same during gentle massage with your partner.